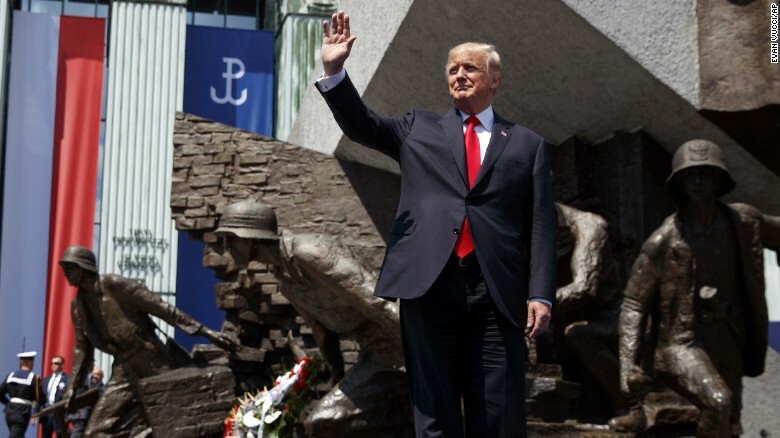 If you have had a chance to listen to or read the transcript of President Donald Trump’s speech at the G-20 summit in Poland yesterday, chances are that you have concluded that Trump is “all in” on igniting a modern-day Crusades against Islam. Nevermind that over the past six or seven centuries that European “explorers” and “colonialists” wreaked havoc, death and destruction while occupying lands in Africa, Asia, the Americas and the Middle East, to let Trump and his ilk tell it, the “West” (read–white Judeo-Christian civilization) is at risk of destruction by “them” (read–Radical Islam). Forget “dog whistles,” this is a straight out call for formal bigoted public policy on a global scale. While troubling, what makes this pill all the more difficult to swallow is the rank hypocrisy in the juxtaposition of “us” (y’all, actually, because Trumpets do not see folks who look like me as “us”) vs “them.” You see, the lofty ideals of liberty, equality and justice, words that historically have rung hollow for the masses of racial and religious minorities in the so-called American Melting Pot, now are being used to inspire the descendants of former colonialists and immigrants to resist immigration while pretending that the ghosts of colonial murder past are not haunting nation states in the form of individuals who have taken it upon themselves to settle the damn score. What is worse is while I abhor the radical pseudo-islamic score settlers, I abhor the lies being told by Trump and his ilk, too. ***“The prerequisite for the success of Western civilization is not material riches. Economic prosperity and military might on their own are not sufficient.” Beg pardon, Mr. Trump, but “Western” society was built on the push for land “ownership” and material riches. Europeans settlers sailed to “new” worlds, sectioned off lands in the name of crown and country, beat, killed or otherwise subjugated the native inhabitants all the while mining and exporting gold, diamonds, tobacco, corn, sugar, Ivory, and Africans to harvest said commodities–all done by use of military force. Folks, this speech was nothing short of a declaration of fealty to the age-old notion of White Supremacy as the linchpin of a “free world.” Make no mistake, I fully know that when Radical pseudo-Islamists set off bombs, shoot bullets or run vehicles into crowds, that they see me as an “American” and would kill me the same as they would any white American. But I also fully know that in the Trumpian world view, that speech was one as the head white man in charge, not the leader of a diverse nation of different colors and religions. As such, Trump’s words abroad will undoubtedly inspire even more enmity among both his latent and overt racist following at home, the ones who despise taxpaying blacks, Latinos and Muslim Americans as much as they do Muslims from foreign countries. Because of that, I cannot applaud this president in the least, rather, it is my solemn duty to resist his anachronistic rhetoric for what it is–bigoted trash!